Yes, I know I've been pretty quiet these past few months. I've been using my 'voice' rebuilding a new and improved website. While most likely still a month away, this is just an early warning. If you pop on the site and it says not available, know that it will be shortly, the change will be happening. And not to worry, your user accounts and orders will be transferred. You will need to create a new password on your first login. but hopefully it will be smooth sailing in the transition. 5th Chakra SymbolWhen thinking of the Throat Chakra, I think most of us assume its natural use of speaking, but it is so much more. Good communication actually has two parts. It is not only speaking, it is also listening. In speaking our truth, we allow everything from our other chakras to be known! Sometimes that can come out in how we write or create art (2nd and 3rd Chakras), how we give love and care (4th and 7th Chakras), where we gain insights (6th Chakra), or how we make our home safe and grounding, (the 1st Chakra). If we are not happy with what is coming out, yes the 4th Chakra could use some work BUT we also need to get to the real issues in other areas. Blue Aragonite, while it was always a pretty one to me, I never took the time to explore all it had to offer - which is A LOT! This little gem has helped me the past few months to incorporate new ways of doing things dispelling what I thought were limitations. Keep in mind that I AM a Taurus, that does not always come easy. While there has been a bit of back and forth, forward progress did happen. 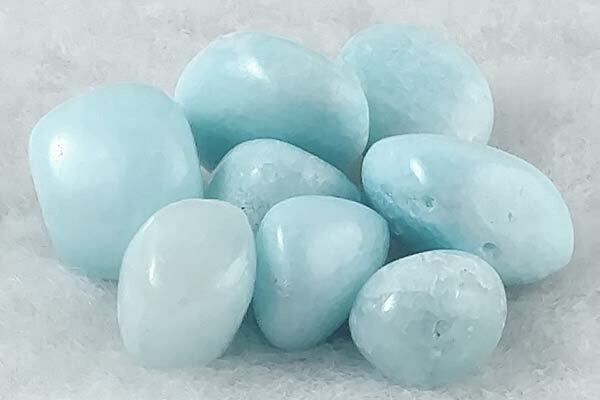 Learn more about this little beauty here: Blue Aragonite.